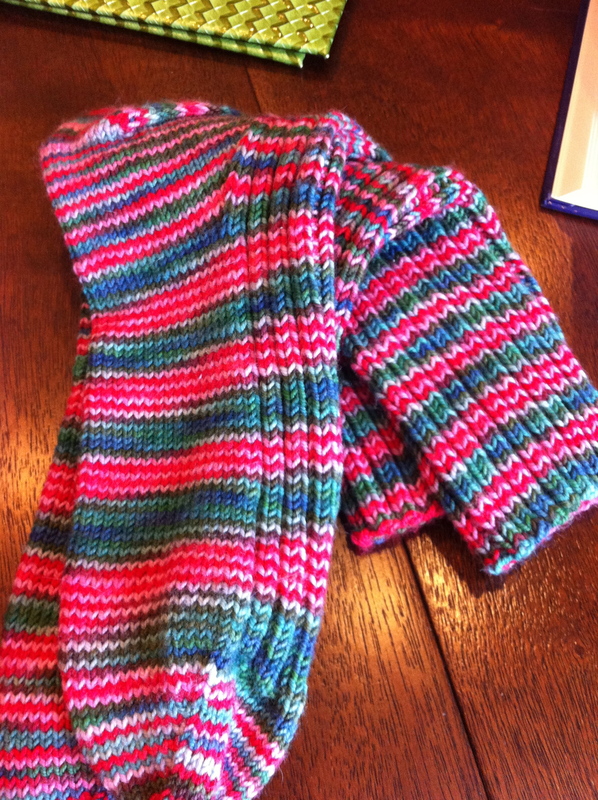 MacGyver Knitting: Sock Edition | Knit Like You Mean It. Casting on. Notice how nicely the yarn’s colors blend – and they’re not TOO Christmassy, even though they’re a December colorway. Yes, people. MacGyver Knitting. You’ve been there. You need a stitch marker, and make do with an earring. You’ve lost all your stitch holders, so you use a chopstick and some rubber bands. You have almost enough yarn, but not quite, but you have a slightly different colorway, and you make the new color look like a design element. What I’m talking about kind of the reverse of Brenda Dayne’s Knitting Scouts MacGyver Badge, which requires a non-knitting use of knitting materials (see, for example, my long-ago wildflower stake). MacGyver Knitting gives a unique sense of satisfaction, the pleasing (if possibly erroneous) idea that you could find a way to get knitting supplies even if trapped on a desert island or huddled in a bomb shelter. And I did it recently with some socks. I was knitting socks for a sick friend who seemed to deserve the luxury of hand-knit socks. I was inspired partly by the last colorway of the 2011 Rockin’ Sock Club. It was called “Comfort and Joy,” which is what I wish for her, and the colors were quite pretty indeed. I cast on in January, on my way to the U.S. for a visit. I made a lot of progress one weekend while on a woodsy-birdsy women’s retreat in Virginia. All blissed out from said retreat, I stuffed the socks-in-progress into my purse, carried it around for a day or so, and then discovered that I’d broken two of my DPNs. Not a shock, since one shouldn’t put thin DPNs into an active purse without some kind of protection. This breakage was on me. This breakage was also foreshadowing, but of course I didn’t know that yet. Still serene, I popped off to fibre space, bought a nice long Knitter’s Pride Symfonie Dreamz needle, and started magic looping. Airplane photo…fuzzy. The yarn is Socks That Rock Rockin’ Sock Club for December 2011. Aside: Dreamz needles are pretty nice. The cables are very flexible and the tips are smooth yet strong. I wish I’d gotten myself the interchangeable set…but I was trying to keep my bags light and my credit card viable. I got a lot of knitting done on the plane back to England, on which I also learned that airplane folks are nice to pregnant ladies. They got me three seats across so that I could stretch out with my belly and my head cold – and an enormous bottle of water, all to myself. I was on the daytime flight again, so watched several movies. I never know whether the movies I enjoy on an airplane are actually good, or whether they seem better because they are distracting me from the discomfort of a coach seat. Anyone else have this problem? At any rate, I made even more progress while watching Crazy, Stupid, Love, and thought I’d be finished in no time. By the time I got home, sock #1 was almost done. 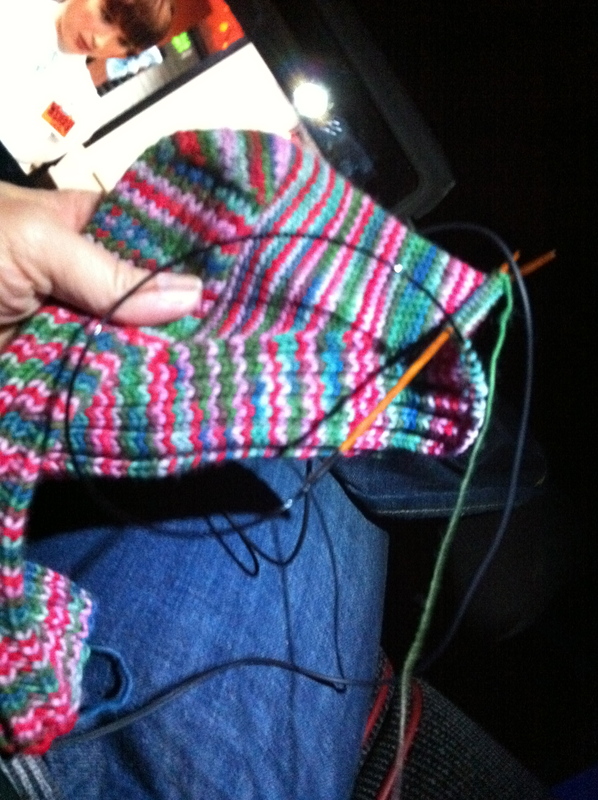 I was plugging along, eager to finish and start sock #2, because I have been known to face second sock syndrome. And then…it happened. I was sitting on the couch. I got up to get some water from the kitchen. When I got back, one of my needle tips was broken. The Great Tragedy: first few rows of second sock, with broken needle tip on left. I can’t explain it any better than that. Did I sit on the needle? Had it broken a while back and I didn’t notice? Was the cat sabotaging my knitting again? I couldn’t even find the broken-off tip. I stared and stared, trying to come to terms with my loss. The thing is, I’ve had trouble finding circular needles in Oxford, much less small-size circular needles. 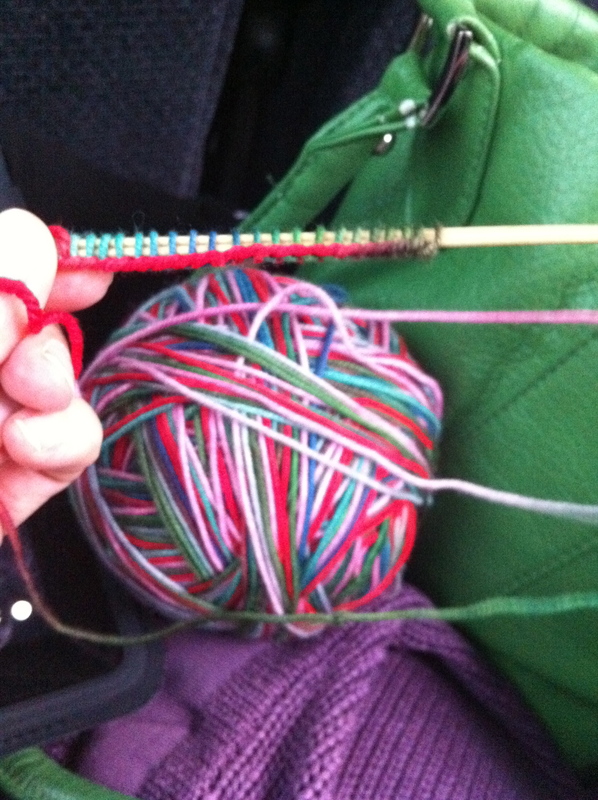 The two shops that do carry knitting needles are pretty much size-6-and-up for circulars. And when they are smaller size (I am going to sound a little spoiled here) they’re those heavy plastic circulars with really rough tips. You know the ones. I couldn’t stand to think about using one of them. Yes, I have been spoiled by the variety of needles available at home. Boo. However it happened, the tip was broken, and it wasn’t coming back. I tore through my extensive needle collection, but while I had about eight different pairs of size 3 Addis and several teeny metal size 0s, of course there were no other size 1s, except the two DPNs left over from the purse-needle-breaking incident. Desperate, I attempted a little repair-work, even though I knew it was a bad idea. Don’t tape a needle back together, ever. It just doesn’t work, no matter how thin the tape, and then you have to scrape all the tape back off, painstakingly, miserably, grinding your teeth and muttering to yourself. At least I resisted the glue idea. In case you are wondering why I didn’t try the obvious solution, yes, I did order a new needle online. It arrived broken as well – according to the vendor, the first time that has ever happened to her (and I believe her). Apparently the knitting gods wanted me to be creative. Spoiler Alert: It all turned out okay in the end. So for a little while I limped along, slipping stitches onto one of the DPNs and knitting off of it back onto the good tip of the circular needle. Tried to be brave. Only tweeted about my pain a few times. Ate a Magnum Bar. Considered getting sand paper and sort of sanding down the broken tip. Decided that was stupid, would lead to gauge issues, and also that I am not competent enough to create a tip using sandpaper. Then I realized something that might have been obvious to a different knitter: when you’re knitting in the round, you only knit off of the left-hand needle. You don’t really need a point, except for stitches like SSK. 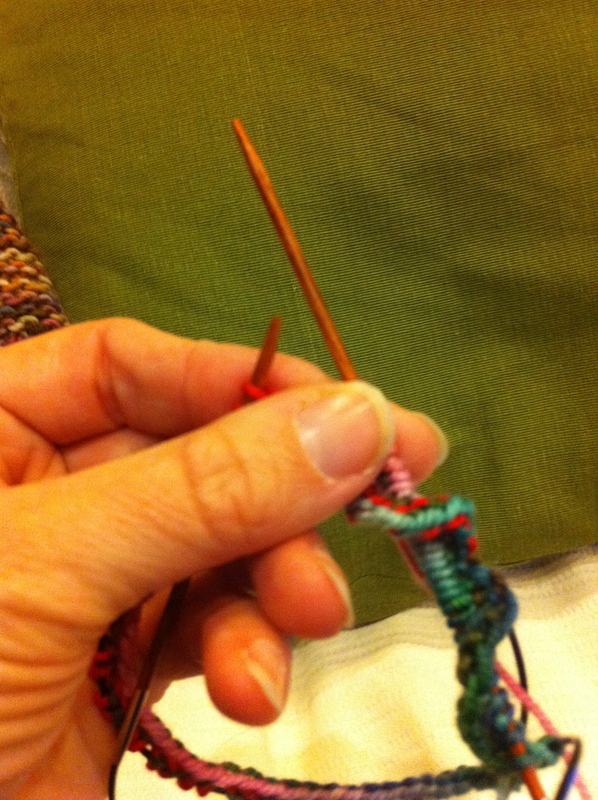 I mean, clearly I’d been knitting with the broken tip for a little while before I realized it was broken. Why couldn’t I continue like that? The answer is, I could. I only needed a left-hand tip for the back-and-forth rows of the heel, and at that point I used one of the remaining DPNs in conjunction with the circular needle. Victory! For the SSK decreases at gusset and toe, I just used the broken left-hand tip, because a size 1 needle is itself so skinny that a broken end of it will serve as a point in a pinch. I even re-knit the toe of sock #2 three times, to make sure the foot lengths matched (like I said, I’m not great at those second socks). The socks are now on the feet of my fabulous friend, and I feel pretty darned impressed with myself. It’s the little things, people. Don’t tell me you don’t feel the same. 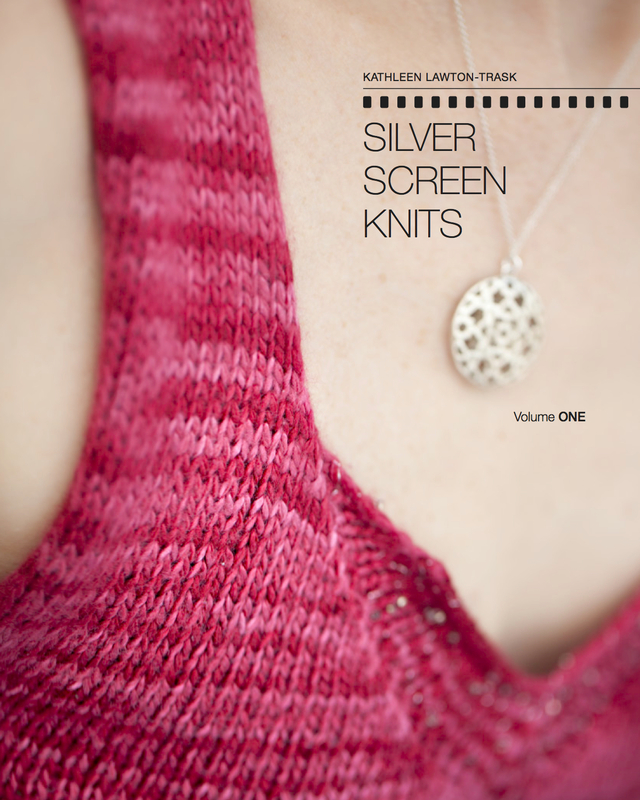 So – when have you engaged in MacGyver Knitting? Tell me how smart you are in the comments field. Or tell me about a movie you saw on an airplane that you thought was great and now suspect might not have been – I need some backup on that. Giveaway update: The winner of the Rowan Calmer was Jeannie, who has a great blog and a new grandchild. Stay tuned for another giveaway later this month. Congrats on outwitting the wily needles! And also for knitting comfort and joy socks for a friend. I hope they brought both into her life. I don’t have enough knitting experience to testify to a MacGyver solution. I would just stop and cry if all those things happen to me…or move onto something else. You’ve inspired all of us. As far as movies on a plane, mine has been the opposite reaction: I generally associate the cramped quarters, poor air quality and crabby neighbors with the movie and therefore dislike it immediately. I used to make it a practice to watch a movie without the sound (that’s when they charged for it) and once watched the entire “Accidental Tourist” and tried to figure out the plot. To this day I have no idea what the movie was about. Hilarious! Can see that movie not lending itself to silent viewing. A girlfriend of mine came to our knitting group with a de-cottoned Q-Tip as a sock needle. She’d dropped one on an airplane, natch, and just never replaced it. I consider her and that story to make her worthy of knitter deification of some kind. show the world the adorable hat and sox you’ve knitted for Baby Lawton-Trask. If you would gird yourself and move to TAAT socks, you would avoid the dreaded SSS…just sayin’.